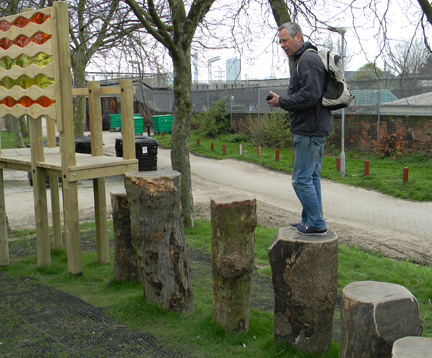 Expert advice and input into Urban95, including participation in internal planning workshops in Bogotá (2016) and Amsterdam (2017), organising a study tour of child-friendly urban design and play space design and management in London in 2017, and delivering a workshop on risk and liability in 2017 for a cross-disciplinary team from Tel Aviv as part of a study tour of Copenhagen organised by Gehl Architects. Masterplanning input on making the major Canada Water London development more child-and family-friendly. Lead consultant to support the development and writing of a risk benefit assessment framework, in a project funded by the Lawson Foundation (see below). Expert input for a Healthy Living, Youth and Play Strategy for the new town of Northstowe, Cambridgeshire (a project funded by Homes England). Tim is a Built Environment Expert for Design Council CABE, the UK Government’s design champion for the built environment, and had a similar role in its predecessor body, the Commission on Architecture and the Built Environment. Input into visioning and brief-setting for flagship play space at Chimney Park, and on selection panel for appointment of designers. Strategic and site-specific visioning, design review, support and advice. Panel member for the design competition for the Magic Garden, an outdoor space at Hampton Court that opened in 2016. Expert input into the development of an Open Spaces Strategy for the London Borough of Barking and Dagenham. Preparation of play implementation plan across the site. Brief-setting for flagship play space at Handyside Park, and on selection panel for appointment of designers. Input into vision, brief and design review for other public spaces. Expert advice on the Foundation’s Canada-wide outdoor play strategy, launched in 2016. More details here. Input into strategic approach to outdoor play, and visioning and design review for natural play spaces at River Lee Country Park Play Trail and Three Mills Green. Input into visioning and brief-setting for play pathfinder programme; on selection panel for appointment of designers of play spaces. On panel for appointment of design team for Kilburn Grange Adventure Playground (RIBA award winner for 2011). Input into visioning and community engagement for play pathfinder programme; devised and implemented play awareness programme for key local authority departments and partners in the public and voluntary sectors. Visioning, design review and other consultancy input into a new play space for Heaton Park (the city’s largest and most popular park). Strategic and site-specific consultancy work on the theme of playfulness, including visioning, risk management policy development and training, site development and play awareness training. Includes site-specific input at Attingham Park, Box Hill and Mottisfont Abbey. Visioning, staff development and communication on risk and outdoor play with policy, professional and public audiences over 3 visits between 2014 and 2016. Read testimonial here. Public realm brief-setting, design review and related work on a number of high-profile development projects in London (as an associate). Evaluation and reportage for ‘Making Play’, a project funded by the Big Lottery Fund that set out to explore contemporary art practice in relation to children’s play. Advice and expert input into various campaigns, including Dirt is Good and Project Sunlight.